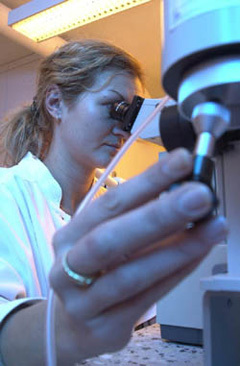 TCDM provides techniques for generating genetically modified mice in an effective manner, and technical support and collaboration is provided in all phases of the project. This includes mouse genome informatics, construct design, transgenic mouse production, ES cell targeting and mouse chimera production.TCDM provides several promoters and expression plasmids for TG mouse production, and have experience with several genomic BAC libraries. For manipulating the large genomic fragments TCDM applies ET –recombination in bacteria. The technique is proven to assist rapid cloning of long, complex DNA fragments.TCDM provides expertise in mouse colony handling, experimental surgery on mice, embryo cryopreservation/recovery and conversion of mouse lines to specific pathogen free status. We also hold several reporter mice and Cre mice at the facility. The clustered, regularly interspaced, short palindromic repeats (CRISPR)-associated protein (Cas) technology is a revolutionizing genetic research tool. The system consists of the Cas9 nuclease and a single guide RNA (sgRNA). The sgRNA, 20 nucleotides in length, guides the Cas9 nuclease to the target sequence, where it introduces double stranded breaks. CRISPR/Cas9 technology enables us to manipulate mouse genome with unprecedented simplicity, speed and superior efficiency. It allows generation of conventional null, point mutations, conditional and reporter alleles in mice in as little as 4 months!